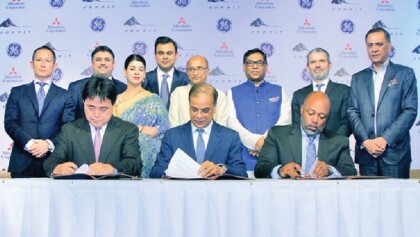 In the biggest ever investment in the power sector, General Electric (GE), an American giant, yesterday signed two deals totalling USD 7.4 billion with public and private sector companies to generate LNG-based 6,000 MW of electricity at Moheshkhali. The Bangladesh Power Development Board (BPDB) yesterday signed a memorandum of understanding (MoU) with GE to build a 3,600 MW LNG-based power plant on the south-eastern island of Moheshkhali with an investment of USD 4.4 billion. GE’s Switzerland unit will own 30 per cent of the joint venture, while BPDB will hold 51 per cent and the remaining 19 per cent will be left for a future strategic investor. The development of the 5,600-acre site is estimated to cost USD 1.6 billion and the power plant will cost USD 2.8 billion. BPDB Chairman Khaled Mahmood and GE Power President and CEO Russell Stokes signed the MoU in Dhaka yesterday. The Prime Minister’s Power, Energy and Mineral Resources Adviser Tawfiq-e-Elahi Chowdhury, State Minister for Power, Energy and Mineral Resources Nasrul Hamid, power secretary Ahmad Kaikaus and US ambassador Marcia Bernicat were present on the occasion. Also, Summit Corporation Limited, the biggest independent power producer in Bangladesh, Mitsubishi Corporation and GE singed an investment deal for USD 3 billion (about Tk 24,000 crore)—the largest private foreign investment in the country—in the presence of Tawfiq-e-Elahi Chowdhury and Nasrul Hamid. This MoU was is in continuation with an earlier deal signed for a joint venture with Mitsubishi Corporation on March 13, 2018 in Singapore in the presence of Prime Minister Sheikh Hasina. Summit will be the majority owner of the project, while Mitsubishi and GE will own the rest. The project is designed to be completed at a global best tariff by 2023 beginning from 2019. The project is expected to be completed in 2023, and it will double Summit’s generation capacity. GE will invest in equity and technology in four combined cycle power plants (total capacity 2,400 MW), with each having a capacity of 600 MW. Mitsubishi Corporation will be the partner for the complete integrated project. The project will use the world’s most efficient and environment-friendly technology. The combined cycle power plants would run on GE’s flagship 9HA gas turbines, which are the world’s largest and most efficient gas turbines in both 50 Hz and 60 Hz categories. The LNG terminal will use cutting-edge technology so that there is no boil-off, utilising all the gas for electricity generation. “GE Power is navigating customers through an energy transformation with a complete portfolio of fuel choices and innovative technology,” said GE president and CEO Russell Stokes. “In partnership with Summit, our HA technology will enable unprecedented levels of efficiency to strengthen Bangladesh’s power generation,” he added.